During the Cold War, the Horn of Africa experienced a particularly volatile form of alliance-switching when the Soviet Union stopped providing aid to Somalia during the 1977–78 Ogaden War in order to support her adversary, Ethiopia. Until the overthrow of Emperor Haile Selassie by the military Derg in 1974, Ethiopia had been backed by the USA which, in turn, now started to support Somalia. At the same time, two armed Eritrean liberation movements fought a war of independence against Ethiopia. Having strong Marxist-Leninist leanings they found themselves no longer confronted with a ‘feudal imperialist’, but instead with an opponent theoretically belonging to the same ideological camp. 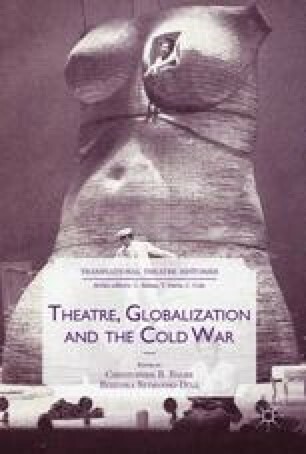 This chapter considers some of the trajectories this changeover provoked in theatre practice in the Eritrean liberation struggle. Starting with the development of ‘revolutionary culture’ in the Eritrean People’s Liberation Front (EPLF), exemplified by a drama critique developed by Alemseged Tesfai, it also examines some extraordinarily lavish productions of ‘world theatre’ staged by an elite group of liberation fighters which seemed to contradict ideas of ‘revolutionary culture’ and ultimately indicate that drama practice in the EPLF transcended the usual Cold War dichotomies. The author gratefully acknowledges the financial assistance of the AHRB, the DAAD and the Cusanuswerk, as well as the administrative support of The Bureau of Cultural Affairs in the Ministry of Education, particularly Solomon Tsehaye, and The British Council in Asmara under its then director Negusse Araya. Thanks to Mussie Tesfagiorgis and Tekeste Yonas for translations and transcripts; to the reading room staff at the Research and Documentation Centre, Asmara; and to Tanja R. Müller and Richard P. Boon for spending time discussing earlier drafts. I would like to dedicate this chapter to the memory of two notable Eritrean writers and theatre artists who passed away at the time of writing in 2012, Beyene Haile and Esayas Tseggai.